Welcome, I see you stumbled onto Fist of Clouds! My name is Liz, and I'm the proud owner of this site. It is a CSS guide, with some premades to offer, too. Feel free to look around, and be welcome to use any content you may like. Why Fist of Clouds, you ask? Well, imagine being punched by a cloud. Would it hurt? Not at all. Hence the "dreaming never hurts" slogan. Life is all about dreams, without them we wouldn't dream of what we have and we wouldn't have what we dream about. I just thought it was cool at the time. It takes a lot of time and dedication to break down codes and arrange them to make it easy for everyone to understand. If you make your own layout following guidelines explained here, I would really appreciate if you give me credit, in any way you want to, but please do so. Also please, please, do NOT remove credits from any layouts you may use. You're free to edit colors or tear them apart however you may, but please leave the link. 15/02/08: Just did some small retouches. And OMG! I'm back! (sort of). I hadn't logged in in such a long time. Everything was so hectic with university+work+moving countries. Jeez, life is so hard sometimes... But anyways, from now on, on my free time I'll be updating the site with new premade stuff and fixing some codes. Some of them have changed in all the time I've been missing. Well, farewell folks. Hope you have been enjoying Fist of Clouds! Feel free to use any of these to link back! A brief intro on CSS. First of all, this CSS help guide introduced here doesn't cover all aspects of CSS3, only the ones you need to know to work on Neopets. And even so, there might be things I don't cover, mainly because of the CSS3 knowledge required to correctly use certain codes. I will also try to be as clear as possible while explaining codes deemed to be explained. If you have ever looked at a site and wondered "how in earth did they do that? ", just right click the page and select 'View Source' for IE or 'View Page Source' for Firefox and Chrome. I do not encourage the use of this tip as a way to steal someone else's work. Use it to check out how they made something work or use the structure as guide to build your own. But be wise and don't get yourself in trouble for stealing. The abbreviation CSS stands for Cascading Style Sheets. It is used for describing the look and format of a file written in markup language (HTML). It has an English syntax to specify style properties, which makes it really easy to understand. Whoa, font class? What do you mean by 'class'? If you're new to CSS you probably wondered what 'class' meant there. Well, CSS allows you to use two selectors: id and class. The id selector is used to specify a style for a single, unique element, and it uses the id attribute of a pound sign (#). Whereas the class selector is used to specify a style for a group of elements, which, unlike id selector, is most often used on several elements, like on the example above: a font. Oh, and it uses the class attribute of a dot (.). Tip: Id selectors are used more frequently for DIV boxes and class selectors are more commonly used to give style to headers and fonts. Pretty basic - if you can't guess how to change dimensions before reading below, you probably shouldn't be experimenting with coding. That's correct! Width and height properties define dimensions. Elements are positioned static by default. Static positioned elements are always positioned according to the normal flow of the page. Fixed elements will "float". They are relatively positioned to the browser outline. Like the menu you see on the bottom of this page. Positioned relatively to its normal position. Absolutely positioned elements are removed from normal flow. They position relatively to the first parent element that is not static. If absolutely positioned, an element can overlap another using the z-index property. Specifies stack order of elements. An element with z-index:-100 will be bottom-most, while z-index:100 will be top-most. Easy peasy. 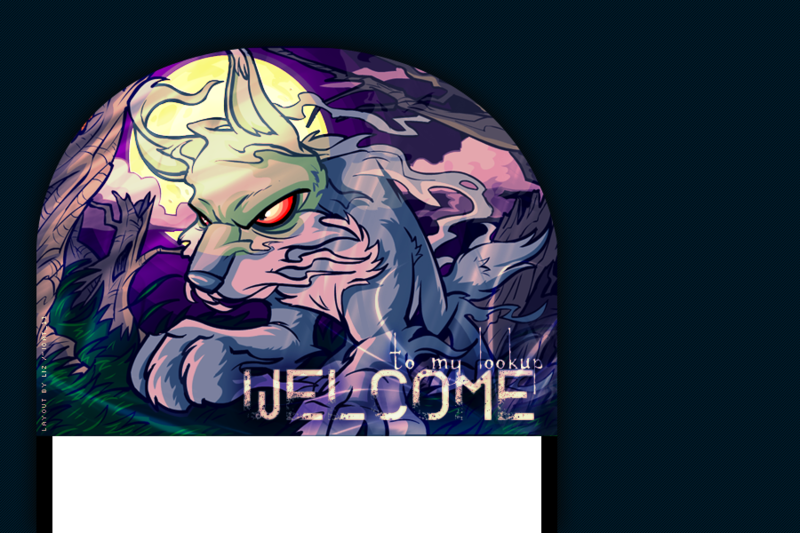 Example: if you want to position a DIV so it fits your awesome banner image, you make it absolutely positioned. If you want it to be on top of your banner image, you make your banner z-index:-100 and your DIV z- index:100. Neo-filter note: Position property has to be bypassed, so rather than putting it inbetween style tags, it goes in the HMTL tags, as shown above. That would make your background black. That inside the box is a shorthand code. Order for shorthand is: color, image, repeat, attachment and position. Text has quite a few properties to be used in CSS. These are: color, alignment, decoration, transformation, direction, letter spacing, line height, word spacing and indentation. There is a few that are not commonly used so I won't go over them. Alignment: Basically, it means whether you want your text to be centered, to the left, to the right or justified. This text is to the right. This text is to the left. This text is justified. This text is justified. This text is justified. This text is justified. i am lowercase and have a letter spacing of 4 pixels. i am uppercase and have a letter spacing of 2 pixels. Text decoration: text-decoration: none; is what you would normally input in a hyperlink declaration-block. Because nobody likes the silly underline regular links have, right? But then again, an overline would be cool, so let's check out our decoration options. I'm neutral I have a roof! I have a floor. I was a cool idea. I blink! Blink declaration only works in Firefox. The following table will show you the values you can input on each. Family refers to the font you will use. Links can be styled with any CSS property. Ex: color, font-family, background, text-decoration, etc. They have 4 states, and they are: a:link, a:active, a:visited and a:hover. See how i did not input a font property on the 'a:hover' block? It is because the style sheet automatically assumes it's the same font face and size. It's kind of neat because it saves you space. Box Navigation: Okay. This is a little tricky but easy nonetheless. First you have to define your "nav" DIV box. Is it going to have a fixed position? Will it float? Is it inside another div? The example below shows a navigation DIV that would be inside another DIV, because it has no position properties. That would be the basics to the links. You can add whatever more you want: borders, make it uppercase or lowercase, you get what I say. The important thing is the "display: block" property: it is what will make your links into boxes. Finish up with your mouse over properties. Notice how I only input text color and background - as I said before, the style sheet automatically applies the style set on the active link (saves you space, yay!). It's quite simple actually. 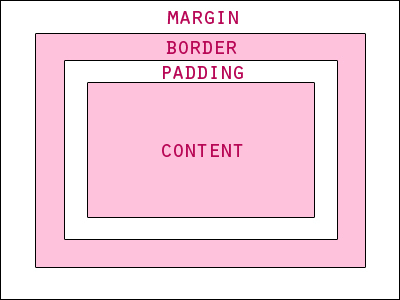 The term "box model" is used in CSS to address design and layout, essentially being a box that wraps around our elements, consisting of margin, border, padding and our actual content. All values for this properties are expressed in pixels, points or ems. But just stick to pixels. If you do your math right, the DIV above is 73 pixels wide instead of 65. When designing a layout, you have to keep in mind that outer values affect the size of the box. Border Properties: Borders, borders, borders. You can make your border thick or thin, pink or green, dotted or ridged. You pick! A DIV box is a customisable section of an HTML page. Some of its properties were explained on the "Box Model" section. It can be as wide and tall as you want, and you can position it either in the flow of the page, or make it have a fixed position. For example, this white container boxes are DIVs going with page flow, and what gives the navigation menu its position is a DIV which position is fixed. A DIV box can have pretty much any of the properties we have covered on this guide: a background, margin, border and padding, change the color of the text inside it, width, height, and all that nifty stuff. Side by Side DIVs: To put 2 DIVs side by side, 'float: left' or 'float: right' must be included in its properties. Oh my god, it is 2 DIVs side by side! I didn't think this was possible! Awesome! Come on, you know you want to try me. Because I'm just a-ma-zing! Hello, I am a text area! Change those parenthesis for tags. I can't do it like that because filter blocks it. Non-link text hover effect: First up, specify a font class. Image hover effect: First, you need your normal image and your on-mouse-over image. Make sure you know their links and dimensions. You can change the 'roll' name to whatever you like - mine is there for educational purposes. Also, the width and height in the code has to be the same width and height of the image you will use. Isn't it neat? The code contained in the following text area is the same one i used. It can be used for DIVs, tables, and whatever has a background really. The following codes are to remove parts of Neopets lookups, shops and petpages, like the annoying Nickelodeon white bar on top of the screen or those blinking adverts that distract your view from a nice design. Enjoy yourself while removing all of them. All the following codes go inbetween style tags. This is where all your spiffy text goes. Feel free to add as much stuff as you like. It is your space after all. You can talk about your devotion towards Dr. Sloth, or your strong desire for a Meepit invasion. That stuff is cool y'know. Or unicorns flying hiiiiigh above the rainbow. Okay, I'm done. No, seriously, it's your turn to fill this up. I mean it, peace. Write inbetween these p tags so it looks how it should. Add as many as necessary. This is container #1. Everything you want shall be written on this box. Like how much you adore Dr. Sloth, and Meepits. Pink Meepits. Hello, your text goes here. Miscellaneous stuff goes in here. Like buttons or icons. Or whatever your heart's desire is. This is where all your text goes. You can fill this up with whatever you want. It is your space after all. Neat, isn't it? ..... And it scrolls, too! ..... And it scrolls, too! Just so you can continue on writing whatever you want on this nifty box, made just for you to write on! Isn't it amazing? All Fist of Clouds contents belong to me, Liz. Please do not reproduce any of it in any way, nor use it without crediting me. Place holders, 'new' and bullets by Foomanshu. Dividers, 'best viewed in' and envelope by The Lunch Box. 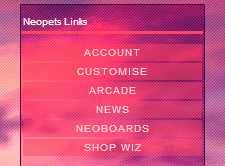 Neopets, Inc., © 1999-2015 | Used With Permission.